Decided to keep this updated once again. I'll keep the list updated as soon as I see something I have to update. * There are two sections, "Not fixed" which is made for bug's that aren't fixed yet and "Fixed which is a section made for bugs that were reported in this thread and got fixed. * There's a priority level for every bug that is not fixed yet, that's based on player's perspective. Description: Well it's simple actually, people name the map I'm talking about "the boat war map". In that war you're supposed to kill monuments that respawn in different locations, everytime Karus/Human nation take a monument, they receive few points and the winners will win based on points or if they get to hold all the monuments at once after 30min they'll win automatically instead of waiting 60min and then invading. Map: Luferson Castle, El Morad Castle, and Moradon. Description #1: It supposes to repel physical attacks and hit back your enemies with certain damage, just like the shield named "Defender of the Lord". Description #2: MP Recovery does not work as well, added a video bellow. Description: By farming "Dragon Marble" (should be dropping from Servant of Isiloon") you should be able to access Felankor cave using that as key and right now you can't farm those and even if you had old ones.. you can't enter into Felankor cave. Description: In this quest you are supposed to kill 60 "Barren", once you complete the quest you can go and visit the NPC that suppose to give you the experience point that you worked for. However, once you click on "Confirm" nothing happens. Bug #25 - [Quest] - [Hidden Truth] Bitter Retaliation ! Description: Once you accept this quest, this NPC is supposed to give you a specific item that you have to deliver to [Captain] Fargo. However, this NPC does not give you the specific item that you need to deliver.. therefore, this quest can't be completed. Description: Once this effect goes off, your enemy shouldn't have the ability to use any type of potion. However, premium potions (Premium Potion HP/MP - 5k package) is working normally with no issue, whether this effect goes off or not. Bug #28 - Exceptional Armor can't be reversed. Items: Any type of exceptional armor, Exceptional Dragon Flights, Mythril, Trial, Ron. Description: Simply can't be reversed although it says on the item's information that it's reversable. Bug #29 - Mistyped "Item drop" - DISC PREM feature. Description: Once you use a "DC Flash" item, you are supposed to get an increased drop rate. However, once you use this specific item, it supposed to add bellow your clan notice/server name "Item drop X0%" but instead it adds "Iteam drop". Description: You can not receive the stipend, once you try to collect it you get 0 coins. However, with national (national points) it works completely fine. Description: Nowadays, you can obtain special wings if you are a war premium user. In order to obtain these wings, you need a Voucher of Oracle and War ancient text. It works fine if you try to obtain damage wings (3%) but it won't work if you try to obtain the damage reduction wings. Description: Once you acquire the necessary item, the NPC behaves as if you don't have the item in your inventory. Simple won't let you complete the quest. Description: Unable to complete the quest, Recon NPC won't give the Reconnaissance Report. Description: After completing the first mission in this quest you won't receive the "Reward Plus" (Screenshot 1,2). Description: Unable to complete the mission, "Awaken Asmodeus" isn't spawning. Description: Unable to complete the mission "Islant's 3 God Weapons", in order to complete it you must deliver Eclipse's spear and it won't drop. Description:This skill suppose to give 15 points for all the stats, right now it gives 15stat point but it doesn't give 15 str, it gives hp/mp/int/dex but no str. Description: Well it just gives less defense when its reversed than it gives when it's not. Description: Once you rebirth a hell breaker +9 it shows it as +1reb. The attacker power and all the stats are showing as +11's but at the item level it says +1reverse. Some people claim that it might confuse people while they're doing trades and might get them scammed eventually. Description: You simply can't pick the castelian item you choose in the quest at Dark Dragon zone. Description: You can't finish the quest for making pauldron of Armor of Destruction, therefore you can't make Talia as well. Description: Once you click Exchange at the NPC, nothing happens.. you don't lose your abyss gems, but also you don't get anything. but for some reason you can't finish the first step in it. Description: Once you click the quest you want to do for making potions, nothing happens. Description: Well, this bug was reported by a few players already and I've seen this bug happening by myself. Nowadays, with the newest BDW system.. once you get killed and press OK you'll get teleported outside of the Border Defense War event to Moradon. In the past, it wouldn't happen.. once you died you would simply press ok and come again. Description: Those two pieces give less defense when they're not rebirthed than rebirthed. It should give the same defense.. Description: Well, once you use a battle cry and move zone you still have the stat points that you used to have before. You shouldn't have these stats after moving a zone unless someone gives you/you use another battle cry skill. Description: You can take this quest normally and complete it. However, you can't pick the EXP once you visit the NPC. Description: You have to kill Centaurs at Lunnar valley and it says that you have to kill 50 kentawooreuseu on quest description. It won't count the kills as well but once you finish killing these 50 centaurs it will complete the quest for you and you'll be able to go and pickup your rewards. So the problem basically is in the kills counter. Description: Once you deliver all the items you need to collect and click on "Yes, I will give it to you", nothing happens. Description: Once you deliver all the items you need to collect and click on "Confirm", nothing happens. Description: At Ronark Land there should be a timer, next to your HP/MP that shows when you're able to start attacking 'Bifrost Monument', the nation (karus or elmorad) that give the last hit on that monument get to enter into Bifrost for two hours, the opposite nation can enter only after 30minutes. Right now, you don't see a timer so you can't really enter into bi frost. Description: Well, nowadays you can complete most of Eslant Quests more than once.. Some of them can't be done twice if you are Human, however.. if you are orc.. you can do all the quests that meant to two-time quests, twice. You can take the quest and everything (as human) and start hunting the mobs you're suppose to hunt but eventually.. the NPC won't reward you with experience point. Quests: Apostle of Cold, Apostle of Flame, Brahman, Gargoil, Doom Soldier. Description: Once you accept this quest, you get teleported into a dungeon. In that dungeon, you're supposed to kill certain mobs and get rewarded. However, in this dungeon there are no mobs at all. Bug #26 -[Quest] - [Crack of All Means] What's the problem? Description: [Blacksmith] Heppa offers an option to create a goblin armor by providing 5 goblin pauldron/boots/gauntlet/pads or helmet and 100k noah, however.. once you have the required items, you'll be unable to complete the quest. 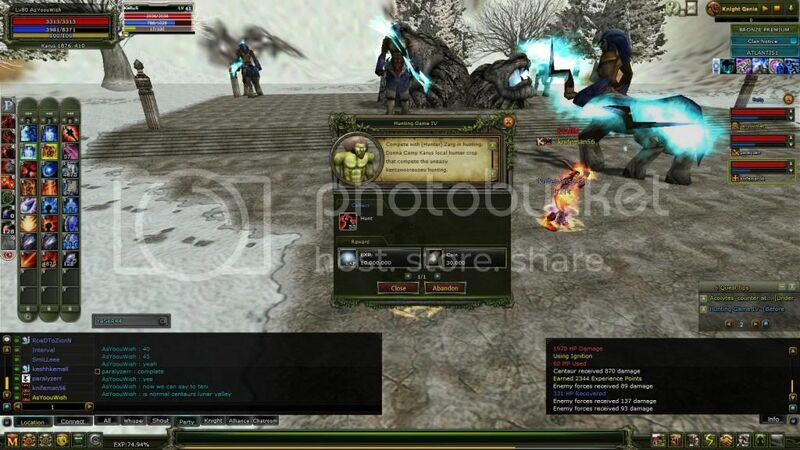 Description: Once you try to summon the required mob for completing the quest by chatting with "12 Devil Summon Stone" (screenshot 1). The stone will take from you the required items for the summoning, but it won't summon any mob. (screenshot 2). Description: As shown in the video above, the item won't be upgraded from +0 to +1. It supposed to be upgradable to +1 with a Blessed Elemental Scroll. Last Update: 24th of March 2016. I'm sure there are more bugs I didn't list here but throw here the bugs you found out on and I'll keep it updated. Last edited by DaDegano; 09-16-2013 at 04:19 PM. Althoug there is a thread by Paul in GD section we can carry with yours in BUG Reports, because that turns out a really chat one :/ Or, let Paul do that to give the latest shape.. I am macking this one as sticky as it is important to share and guys, please just try to write down ones and Adi will add your to his first comment. oh nice, well I'll let other players in-game & gladiatorz fan page to know they can post here their bug reports and I'll edit the main post. I just hope something gonna be done about these bugs. Last edited by DaDegano; 06-21-2014 at 08:00 PM. I'd Like to report a bug, its about getting the Stamp of dexterity, you con take the quest and collect the itens, but when you try to retrieve the quest nothing happens..
First was the lvl 72 skill for rogue, now that they fixed the skill, the quest to get the itens for that skill is bugged! Plz someone help me. I'm pretty sure i'm not the only one having this issue. Can you tell me what's the quest name so I check it by myself first?